Condominium prices have increased 6.1 percent since last year. 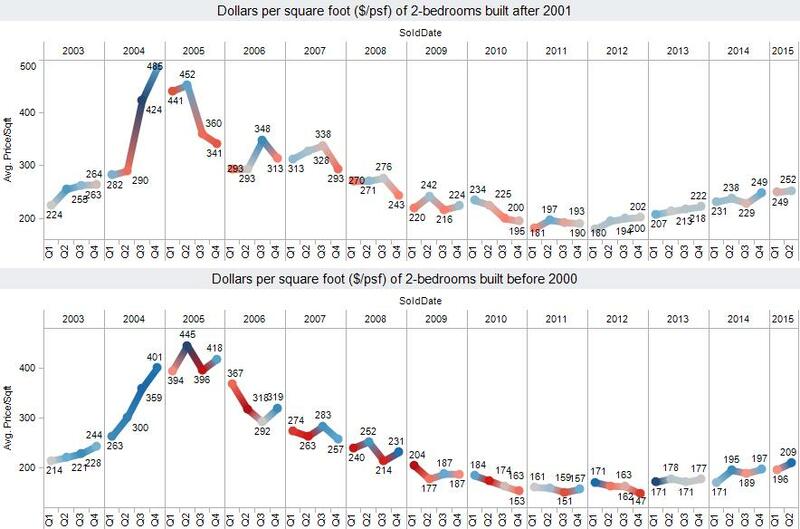 Two-bedroom condos built since 2001 are selling at an average of $252 per square foot. This is basically unchanged from the $249 per square foot price seen in the fourth quarter of 2014. 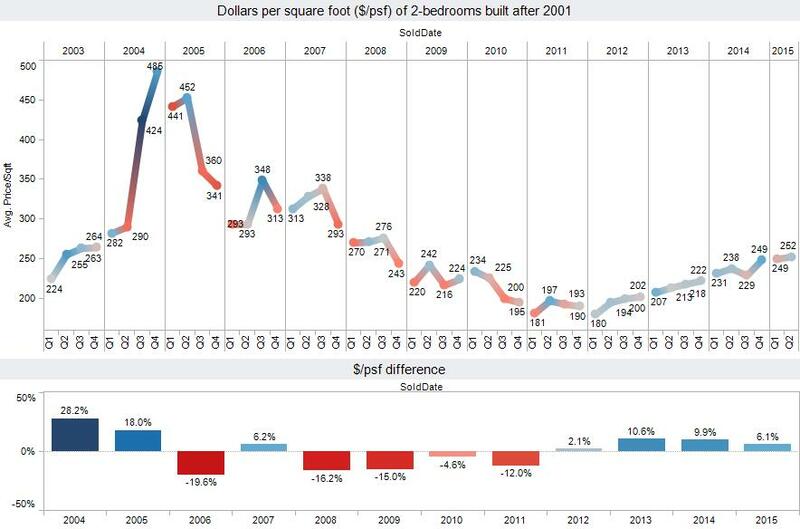 The graph doesn't tell the whole story since most floor plans are experiencing 10 percent annual price increases. The catch is there is stronger absorption of floor plans with below average prices per square foot. Condominiums such as Shores of Panama still are selling at slightly less than $200 per square foot. However, condos such as Palazzo, Aqua and Calypso have floor plans selling for more than $300 per square foot. 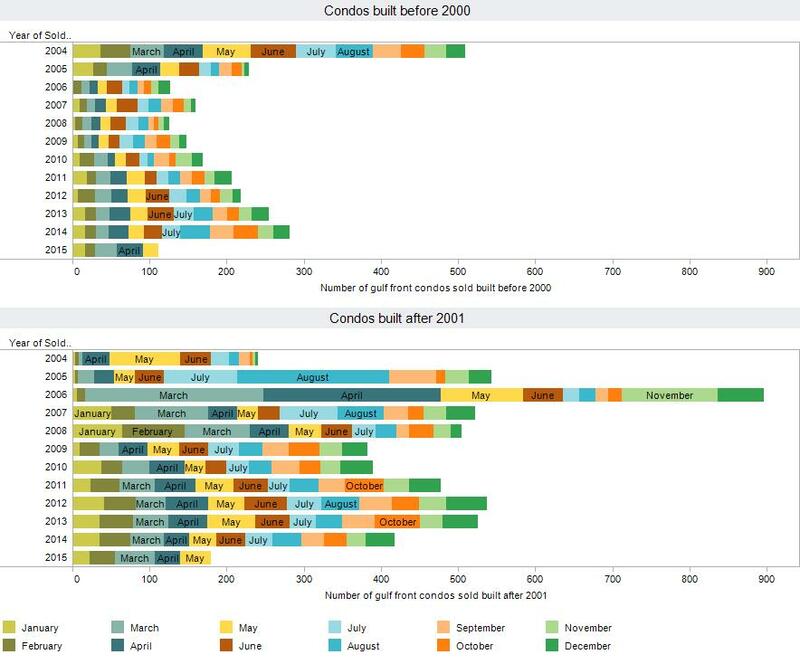 An identical trend is occurring to condominiums built prior to 2000. Absorption in that market is much stronger than previous years. To get an idea of the histories of individual floor plans, check out the condominium sales history articles below. Looking at the current sales for older condos versus newer ones exposes opposing trends: Condos built prior to 2001 show a 20% increase in sales volume compared to the previous year. Condos built after 2001 show a 4% drop in sales volume. The figures display a move toward absorbing older condominiums. This new trend can be attributed to large price increases in the newer condominium market. Older and newer Panama City Beach condominiums still have significant price differences. Created on 09 June 2015 . We kind of want to wait and see if the new spring break rules by the city wlll either increase or decrease the sale of condos if people can't rent them because the kids won't come there any more if they can't party on the beach. Personally, I think they should all go to Cuba and help rebuild their economy. We'll be in touch when we're sincerely serious about buying.